Voters in Fayetteville, Arkansas, narrowly repealed an ordinance banning anti-LGBT discrimination on Tuesday. The final tally was 7,523 votes in favor of repealing the ordinance, or 52 percent, to 7,040 votes against repeal, or 48 percent. Turnout was high for a special election, at 29 percent or 14,600 votes. That’s compared to 21,457 Fayetteville residents who cast ballots in the Nov. 4 general election. The City Council approved the ordinance in August after 10 hours of debate, but opponents gathered enough signatures to place it on the ballot. Fayetteville would have been the first city in Arkansas to ban anti-LGBT discrimination. Alderman Matthew Petty, the ordinance’s sponsor, said he was disappointed but not discouraged after results were announced at Fresco Cafe & Pub, where supporters of the group Keep Fayetteville Fair gathered. Petty said Tuesday night it’s too soon to tell if the City Council will consider a revised version of a similar ordinance. “We’re going to consider all options,” he said. Despite the setback, there were signs of progress in the results. Sixteen years ago, when Fayetteville voters repealed an ordinance protecting only gay city employees — the margin was 58 percent to 42 percent. The ordinance voted on Tuesday was much broader in its scope, applying citywide and including transgender protections. Opposition to the ordinance was led by the likes of reality TV star Josh Duggar, as well as several Republican members of the Arkansas Legislature, who threatened to overturn the measure anyway if it was upheld by voters. A great victory for religious liberty & freedom. 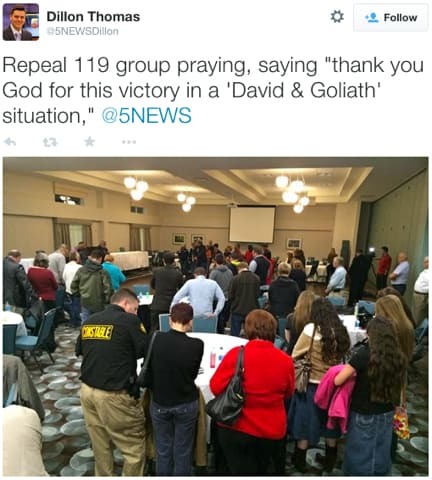 A great win for small businesses and churches in Fayetteville and Arkansas! Thanks to all who helped w/ the #Repeal119 campaign in Fayetteville, AR – supporting equality for ALL Fayetteville citizens!